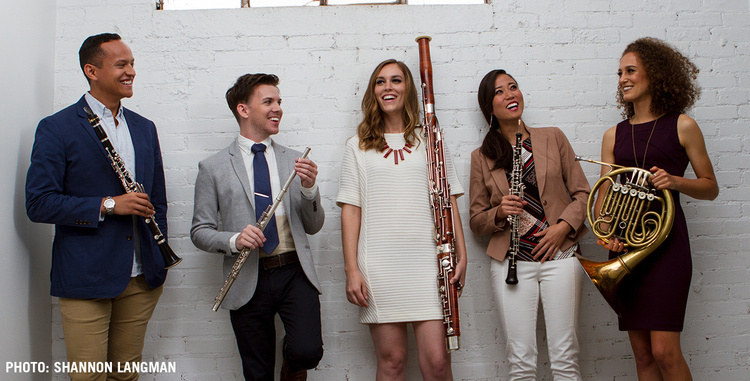 Hailed by the Houston Chronicle as “revolutionary chamber musicians,” WindSync is a fresh, energetic wind quintet recognized for dramatic and engaging interpretations of classical music. A winner of the 2012 Concert Artists Guild Competition and the 2016 Gold Medal in the Fischoff Competition, these five virtuoso players perform exclusively by memory and connect with audiences through adventurous programming and charismatic stage presence. Strongly committed to education, WindSync’s latest initiative is the Play Different Project, a campaign against bullying which teaches tolerance through music and poetry.